That is until food is involved. You see, we grew up eating two completely separate diets. I lived in multicultural Australia with a Mum who cooked dinner every night and where it wasn't unusual to go from an Asian stir fry one night to Middle Eastern style koftas the next, finishing up the week with a traditional English roast dinner. Jesse on the other hand, rarely had a home cooked meal and was the king of convenience meals. The foods I grew up on were completely different to the ones Jesse grew up on - and living on opposite sides of the planet meant that my staple foods were totally unheard of to Jesse and his absolute favourites were only recognisable to me if I'd seen them on TV. When Jesse first moved to Australia we were deciding what to have for dinner one night when Jesse piped up and said "What about Hamburger Helper?" Kristy: "Hamburgers? I guess we could have hamburgers...."
Kristy: "Huh? Helper? Why do you need a helper to make hamburgers? 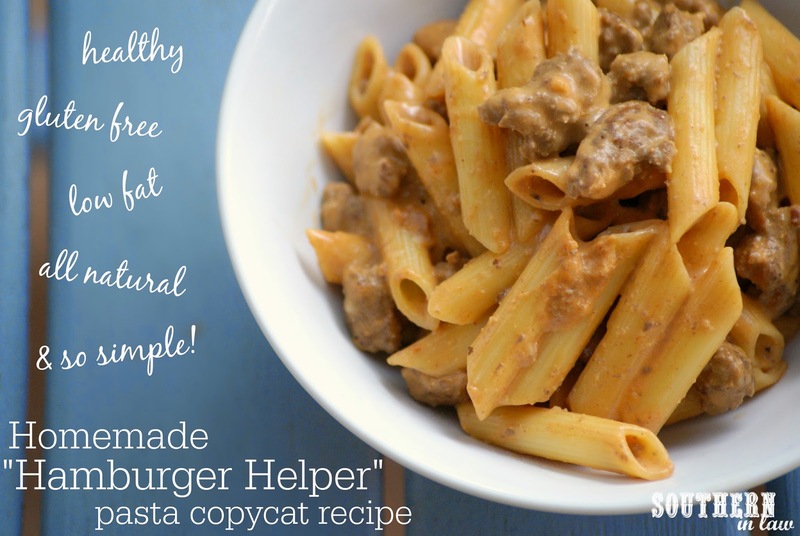 They're pretty easy.... you know... meat... cheese..."
That's about the point where my brain exploded and I had no idea what Jesse was talking about - so I got to googling and there I discovered Hamburger Helper was indeed pasta - kind of like Kraft boxed mac and cheese but you added in some "hamburger meet" (aka: beef mince/ground beef). When I looked up the ingredient list, I felt like I needed to learn a foreign language to understand it - as well as some glasses and a cup of tea because that list was long - and it was then that I decided to make a healthier, real food version for Jesse to enjoy. 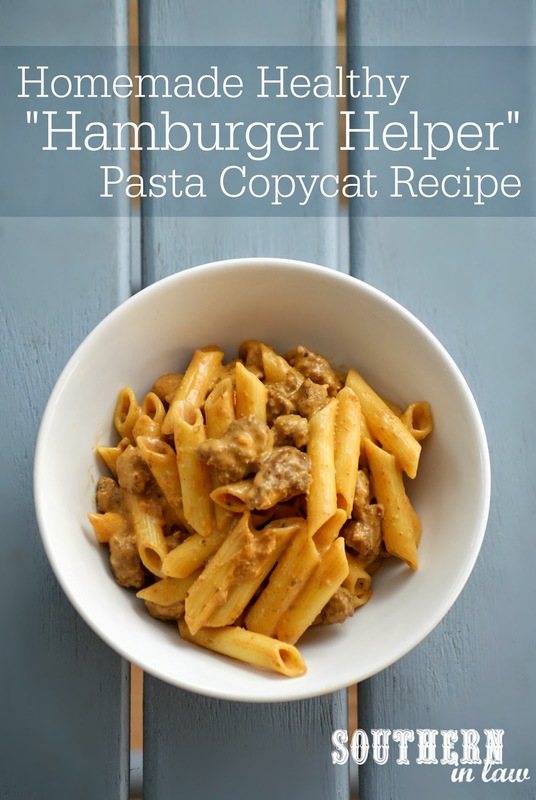 It took me quite a few tries and tweaks but eventually I came up with what Jesse calls the perfect copycat - and there's no foreign sounding ingredients in sight! serves one, easily multiplied to feed a few or a bunch! To avoid unnecessary clean up, we always cook this in the one pan - first starting with the pasta and cooking according to package instructions. Once your pasta is cooked, drain and rinse it and set it aside in a colander/strainer. Cook your mince over a medium-high heat until browned and cooked through, stirring to ensure everything is cooked evenly. Season to taste with your seasonings and add in your cream cheese and pasta, reducing the heat to medium-low. 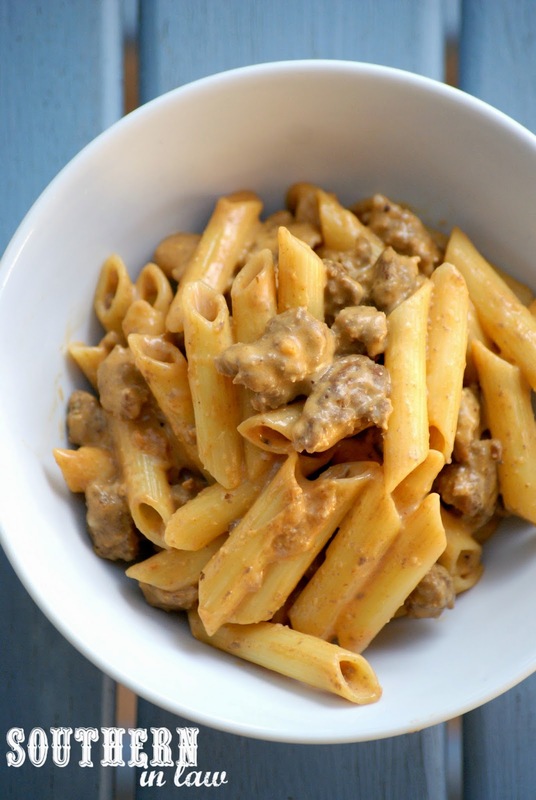 Stir your pasta, allowing the cream cheese to melt and mix through your meat and pasta. If needed, add in a tablespoon or so of milk or water to allow your cream cheese to coat your pasta mixture. Once your cream cheese has melted, add in your parmesan cheese, stirring to incorporate all of your ingredients, allowing the parmesan to melt and mix through. Serve immediately as is or with a side salad/veggies of your choice! *We always use gluten free penne (with me being a coeliac), however, you can use any size/shape/type you fancy! **You'll notice we're pretty open with the seasonings here and that's because it depends on where we are and who's eating it. We use either this all purpose seasoning or McCormick's Season All Original (because it's what we've always had in the pantry - though it has a couple of added ingredients i'm not too fond of), however, when making it for me (as I can't have chilli) I use this Garlic Bread Seasoning Mix which gives it a different flavour but it still tastes great. Play around with your favourite seasonings and see what you like best! But tell me, what was dinner like in your house when you were a kid? What are your favourite meals from your childhood?